Last week I had a very pleasant experience. I went to the bank with two jars of change and cashed them in. The jars were the regular plastic one kilogram peanut butter jars. I’d estimate they hold about a litre. Whenever I get home from any sort of shopping, like most other guys, I empty my pockets of change. After getting sick of it slowly covering most horizontal surfaces, I saved the peanut butter jars, cleaned them, and started using them as change-dumps. When I had two jars filled, off to the bank I went. Imagine my delight when I learned the change totalled $866.89! Granted that’s probably about three years of change, but like I said, a very pleasant experience! The new Liberal government has issued their first budget. Despite their promise to spend us back to growth by indulging in a modest $10 billion deficit, the budget includes a $30 billion deficit.1 The prime minister has stated that this is the time to spend because of the ridiculously low interest rates. Unfortunately, the budget is missing any reference or plan about when or how federal government spending will come back into balance. What bothers me about this, beyond how the promised deficit has tripled between the election and the budget, is how there’s no reference anywhere to debt. If a low interest rate allows the government to spend more than it has, they have to pay the money back before the rate goes up to avoid fiscal damage. To stop spending more than they have isn’t enough! Imagine they’re going to incur a $30 billion deficit this year and balance the budget next year and stay balanced until doomsday. In this situation, that $30 billion debt is never paid back and we pay interest in it every year. When the interest rate goes back up, the interest we pay every year also increases and our tax money buys less. The problem is that our federal debt will not be $30 billion. It’s currently in the neighbourhood is $616 billion.2 I have no idea what interest rate the government pays on its debt, but the current prime rate is 2.70%. If this is the rate the government pays, they owe nearly $17 billion dollars just for servicing the debt. Before the government spends a penny, $17 billion comes off the top simply because they’re carrying more than half a trillion dollars of debt. While $17 billion is a tidy sum, most people will claim it’s not a huge amount, but like the warnings the government has been making to Canadian borrowers, what happens when interest rates finally go up? I can’t ignore it so easily, and their failure to even once say the word makes me increasingly uncomfortable. I had a bit of an adventure this afternoon. It started with the graphic you see below, shared on Facebook by someone I know here in town. From a fairness point of view, all else being equal, it doesn’t leave me with a good feeling. Of course all else is not equal, but politicians lead us, and they should act like leaders. The situation as depicted in the graphic doesn’t put the politicians is a good light. And make no mistake, they control the light. Looking purely at the numbers, it’s difficult to compare only percentages. There are 308 MPs in the Canadian House of Commons. Multiple sources on the web indicated that their 2013 salary was $160,200. An 11% increase is $17,622, bringing their salaries to $177,822, each. Multiplying the increase by number of MPs brings to total cost of their raise to $5,427,576. Turning my attention to nurses, the Ontario Nurses’ Association has a table in their FAQ that lists their 2011 and 2013 salaries based on their seniority. To keep things simple, I took a starting RN’s pay for 2013 ($58,831.50) and calculated that an 11% increase would be $6471.47. According to the Registered Practical Nurses Association of Ontario, there were 127,611 nurses in Ontario in 2012. Multiplying the 11% increase by the number of nurses give us a minimum of $825,830,758.17. Coincidentally, the provincial government just released their budget, and the total amount the province will spend is $130.4 billion dollars. Deserving or not, it’s no surprise that the province isn’t rushing to spend more than one half of one percent of the entire budget on nurse raises. Not salaries, but only raises! At that point I paused. I wanted some other confirmation of this 11% figure. My search took me to a Huffington Post article, “How Much Do Canadian MPs And Senators Make?” This article corroborated the $160,200 salary figure for 2013, but it claimed that their increase was 2.2% meaning their current salary is $163,700. What’s going on here? I looked at the graphic again and things started to fall into place. Notice how close the MPs are? That’s because they’re sitting on a bench seat. In Canada, MPs have chairs, while in the U.K., MPs sit on long leather-upholstered benches. I ran the numbers and the increase between 2011 and 2013 ranges from 2.736% to 2.764%. 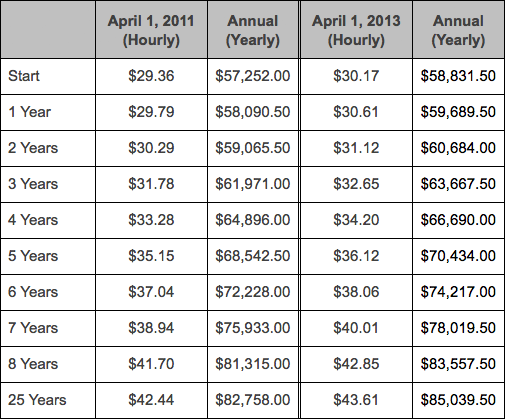 The thing is, the starting salary for example, increases from $57,252 to $58,831.50, which is 2.758%. But if a nurse starts at $57,252 in 2011, by the time 2013 rolls around, she’ll have risen to the 2 year 2013 salary amount, which is $60,684. That’s a two-year increase of 5.995%. Because of this, the two-year increases vary between 2.758% for those nurses with between 10 and 24 years of experience in 2013, and 15.686% for nurses with 8 years of experience in 2013. Are Ontario nurses being treated as shabbily as the graphic would have us believe? I don’t know because the Ontario Nurses’ Association hasn’t updated their FAQ. 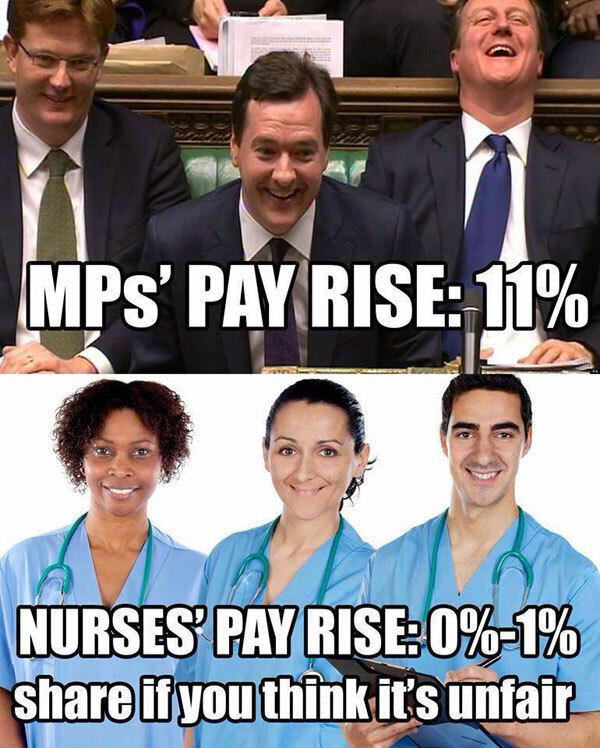 Comparing MP salary increase this year and nurses salaries between 2011 and 2013, some nurses are doing a little worse than MPs, some nurses are doing better, and a small number of nurses are doing much better. Looking back at MP increases, the nurses did far better. Last year the MP salary increase was 1.6 %. In each of the three years before that, the MPs received no increase at all. Where does this leave us? It leaves me understanding that one must sometime dig a little when presented with information. I sent off a letter today. Yes, in the post! I’ve had a very curious experience that I’d like your help in understanding. I’ve been slowly replacing my favourite paperback books with e-books. Today, I noticed the poor condition of my copy of Dragon’s Egg by the late Robert L. Forward and was pleased to see that Amazon.com has the Kindle edition of the book for $9.99. Starting the purchase process, I logged in, and I quickly noted that the price changed because I live in Canada, and I have to pay the Canadian price. It’s also explicitly noted that the publisher, Random House Canada, sets the price. Imagine my surprise when I saw that the Canadian price is $20.99! You can’t fall back on the import and transportation costs, since this is an electronic product. This is doubly true since I wasn’t even buying it from the Canadian subsidiary of Amazon. You can’t claim the dollar difference would double the price as today’s rate is a hair under 10% so the price should be 11 Canadian dollars … though Amazon.com takes payment in US dollars so my credit card company would have made the exchange automatically. So help me understand what’s going on here. Why are your Canadian customers being charged twice as much? It seems like a blatant ripoff, but I’d like to believe that’s not the case. Unfortunately, the facts in my possession show we’re being taken advantage of. I’m hoping you can shed some light on the situation. We receive hundreds of inquiries a day by email, phone and fax, and cannot answer everyone immediately. I am curious what they will say, and even though I can’t imagine anything satisfactory, it’s only fair to hear them out. Still, I expect nothing but marketing double-talk on their part and even more determined use of the library on mine. You can tell the difference between a liberal and conservative by the following test: A liberal believes that changes in taxes have very little effect on production, but huge effects favorable on distribution. Folks like myself believe it’s exactly the opposite. Very high tax rates or even small changes in taxes have very adverse effects on production, and they do very little to produce redistribution because the money gets dissipated and taken away through the political process in ways that the most ardent supporters of redistribution will not like. Hat tip: Kevin at The Smallest Minority.